List of Volkswagen Group petrol engines. The spark-ignition petrol engines listed below are currently[when?] used by 2010[citation needed] and also in Volkswagen Industrial Motor applications. All listed engines operate on the four-stroke cycle, and unless stated otherwise, use a wet sump lubrication system, and are water-cooled. Rated motive power output (in kilowatts). The petrol engines which Volkswagen Group previously manufactured and installed are in the list of discontinued Volkswagen Group petrol engines article. The EA111 series of internal combustion engines was introduced in the mid-1970s in the Audi 50, and shortly after in the original Volkswagen Polo. It is a series of water-cooled inline three- and inline four-cylinder petrol and diesel engines, in a variety of displacement sizes. This overhead camshaft engine features a crossflow cylinder head design. The camshaft is driven by a toothed belt from the crankshaft, this belt also provides the drive for an intermediate shaft that internally operates the oil pump and ignition distributor. Other "V" belt driven accessories are the water cooling pump, alternator and (if fitted) power steering. In transverse mount configuration the exhaust side is towards the vehicle firewall, in longitudinal configuration the exhaust side is to the right as you face front in either left or right hand drive vehicles. The EA211 engines are a completely new four-cylinder turbocharged and direct-injection TSI engines. Compared to its predecessor, the EA211 series is significantly more compact, with installation length 50 mm (2.0 in) shorter, thus offering more interior space. The installation position of the engines has also been optimised. Just as in the diesels, the petrol engines are now mounted with the exhaust side facing backwards and tilted at an angle of 12 degrees. The weight of these petrol engines made of die-cast aluminium is only 97 kg (214 lb) for the 1.2 TSI and 106 kg (234 lb) for the 1.4 TSI. The crankshaft alone became lighter by 20 per cent; the connecting rods lost 30 per cent of their weight. In addition the connecting rod bearing journals are now hollow-drilled and pistons now come with flat bottoms, all of them optimized for lower weight. Regarding thermal management, the EA211 petrol engine is equipped with a modern dual-circuit cooling system. That means that a high temperature circuit with a mechanically driven cooling pump cools the basic engine, while a low temperature circuit flows through the intercooler and the turbo-charger casing. The cylinder-head circuit heats the cabin's interior. The exhaust manifold is integrated into the cylinder head, enabling the engine to warm up more quickly, in turn making heat available quickly for the passenger cabin. At high loads, the exhaust is cooled by the coolant, lowering fuel consumption. EA 824 and EA 825 are families of twin turbo 90 degrees V8 spark ignition engines. Audi uses the EA 824, while Porsche uses EA 825 for Panamera Turbo. EA 825 uses two twin-scroll turbochargers, iron coating on the cylinder linings, 250 bar (3,626 psi) fuel injector at centre of combustion chamber, cylinder deactivation at 950-3500rpm with a 250 N⋅m (184 lb⋅ft) torque limit. EA 839 is a family of turbocharged 90 degrees V6 spark ignition engines. It includes steel cylinder liners, balancer shaft located within the vee, maximum compression ratio of 11.2:1, bore and stroke of 84.5 mm × 89 mm (3.33 in × 3.50 in). The EA888 engines are a family of three and four cylinder engines that are currently in use across the Volkswagen Group. The EA888 family is an Audi-designed unit that features some of the latest engine technology such as direct fuel injection, sintered camshaft lobes, thin-walled engine block, variable valve timing and lift for intake and exhaust valves, downstream oxygen sensors, exhaust manifold integrated into cylinder head, exhaust gas recirculation and cooling, distributorless coil-on-plug ignition, lightweight engine internals, slide valve thermostat (some variants), and the addition of port fuel injection to aid low load fuel consumption and cold start emissions. The port fuel injection also aids in reducing the potential carbon deposits that can occur in direct injected engines. As of 2016, the 'dual injection' system has not been offered in North American markets. Still, Volkswagen has made numerous enhancements to their engine designs such as the positive crankcase ventilation, repositioning injectors and more to lessen the potential that carbon deposits accumulate on intake valves. Currently, the EA888 engine is available in two sizes: 1.8T and 2.0T. Engine output ranges from 111 kilowatts (151 PS; 149 bhp) to over 223 kilowatts (303 PS; 299 bhp). A concept car based on the Volkswagen Golf R, dubbed R400, produced 395 hp from 2 litres of displacement. Furthermore, the R400 would be able to accelerate from 0–100 in just 3.8 seconds, thanks to a haldex 4-wheel drive system, and a 6-speed DSG gearbox. This all-aluminium alloy engine is manufactured at the Škoda Auto plant in Mladá Boleslav. The EA827 family of internal combustion engines was introduced in 1972 in the Audi 80, and was eventually superseded by the EA113 evolution introduced in 1993. Both share the same 88 millimetres (3.46 in) cylinder spacing. The latter EA113 was updated with Fuel Stratified Injection (FSI) direct injection, to be topped by the 200 kilowatts (272 PS; 268 bhp) 2.0 TFSI used in the Audi TTS. Forty million engines have been produced. This range will eventually be superseded by the all new EA888 project, introduced with the 1.8 TSI/TFSI below, but the EA113 still remains in production. "VW presents new 1.2 litre TSI and 1.6 litre TDI engines for Golf and Polo". WorldCarFans.com. Volkswagen AG. 13 May 2009. Retrieved 28 December 2009. "New engines 1.2 TSI for Leon and Altea". SEAT.com. SEAT. 5 March 2010. Archived from the original on 16 July 2011. Retrieved 5 March 2010. "New engine 1.2 TSI for Octavia". skoda-auto.com. Škoda Auto. 25 January 2010. Archived from the original on 28 July 2011. Retrieved 26 January 2010. These newly developed generation of modern petrol engines are manufactured at the Škoda Auto plant in Mladá Boleslav. EA211 engine family. Turbocharged and direct-injection TSI engines with a four-cylinder, four-valve layout and belt driven camshafts. The entry-level petrol engine. Turbocharging produces a maximum torque of 160 Nm (at 1,400 to 3,500 rpm). The improved performance version of the 1.2 TSI Green tec, which includes a start/stop system and brake energy recuperation, manages an output of 77 kW (105 hp). This TSI engine provides a maximum torque of 175 Nm at between 1,400 and 4,000 rpm. Based on the EA111, this new engine was announced at the 2005 Frankfurt Motor Show, to be first used in the Mk5 Golf GT, the 125 kW 1.4-litre TSI engine is a "Twincharger", and uses both a turbocharger and a supercharger. Its displacement downsizing leads to improved fuel economy, with 14% more power than the 2.0 FSI, but consuming 5% less fuel. The mechanical supercharger compressor, driven at 1.5 times the speed of the crankshaft, mainly operates at low engine speeds from idle up to 2,400 revolutions per minute (rpm) to increase low-end torque. At engine speeds just above idle, the belt-driven supercharger provides a boost pressure of 1.2 bars (17.4 psi). The turbocharger assumes full effectiveness at middle revs, and the engine map disengages the clutch-controlled supercharger at a maximum upper limit of 3,500 rpm; the supercharger will then be bypassed once the turbocharger spools up and reaches sufficient speed to provide adequate boost in the upper rev-ranges. 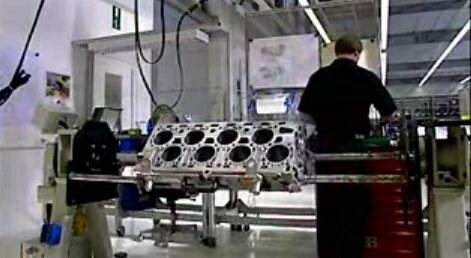 This engine is made at Volkswagen-Motorenfertigung, Chemnitz. In 2007, Volkswagen announced the 90 kW model which will replace the 1.6 FSI 85 kW (116 PS; 114 bhp) engine. This engine differs from the 103 kW and 125 kW models in several ways. It uses only one method of forced induction – a turbocharger (and not a supercharger), and has water-cooled intercooler. The engine has reduced frictional losses, optimised camshafts, new intake ports, and new high-pressure injector valves. It is also 14 kilograms (31 lb) lighter than the 125 kW model, in order to improve fuel economy and reduce emissions. "Volkswagen Golf GT TSI – Supercharged and Turbocharged 1.4L". VWVortex.com. Volkswagen AG. 29 August 2005. Archived from the original on 25 February 2008. Retrieved 6 September 2009. "In a nutshell: Engine Technology 2006". Volkswagen-Media-Services.com (Press release). Volkswagen AG. 16 March 2006. Archived from the original on 1 November 2007. Retrieved 7 September 2009. "To the Point: TSI Offensive" (Press release). Volkswagen AG. 29 May 2007. Archived from the original on 3 July 2007. "New VW 122 PS TSI Engine in detail". WorldCarFans.com. Volkswagen AG. 29 May 2007. Retrieved 7 September 2009. Parks, Jim (10 July 2009). "Eaton Supercharger Boosts VW Green Engine Of The Year". Eaton.com. Eaton Corporation. Retrieved 24 July 2009. The highly regarded engine was named International Engine of the Year, Best Engine in the 1-litre to 1.4-litre category, and Green Engine of the Year, ahead of state-of-the-art hybrid and twin-turbo diesel competition. Was winner of the "Best New Engine" category in the 2006 annual competition for International Engine of the Year. Was winner of the "1.0-litre 1.4-litre" category for six consecutive years in the 2006, 2007, 2008, 2009, 2010 and 2011 annual competition for International Engine of the Year. Was winner of the "Green Engine of the Year" category in the 2009 annual competition for International Engine of the Year. Was outright overall winner of the 2009 and 2010 International Engine of the Year annual competition. 1.4 TFSI Green tec engine with 110 kW (140 hp). This engine achieves its maximum torque of 250 Nm at 1,500 to 3,500 rpm. In North American market it is referred to as CZTA type engine (150 hp). In Chilean market it is referred to as CHPA type engine (140 hp) or CZDA type engine (150 hp). New lightweight aluminum construction, an integrated (into the head) exhaust manifold, and a toothed-belt drive for its double overhead camshaft valvetrain that incorporates variable intake and exhaust timing. The only aspect to be carried over from the EA111 engine that preceded it is the 82 mm cylinder spacing. The cylinder bore was decreased by 2 mm (to 74.5mm) while the stroke was increased to 80mm, a change which helps compactness, increases torque, and is ideal for adding boost. ADF 1.8 ltr [sic] Carburettor engine (PDF). mi-uk.com. Volkswagen AG. September 1993. Archived from the original (PDF) on 30 July 2013. Retrieved 12 November 2009. Wholly created and developed by AUDI AG, this version is a 1.8-litre 20-valve turbocharged engine built in Wolfsburg, Germany; Győr, Hungary; and Puebla, Mexico. Output varies based on internal component selection, turbocharger, and engine control unit (ECU) software. This ubiquitous power plant has been extensively used in all four mainstream Volkswagen Group marques, along with Volkswagen Industrial Motor applications. This engine is also used in a very high state of tune in the one-make Formula Palmer Audi (FPA) open-wheeled auto racing series. It develops 300 brake horsepower (224 kW; 304 PS), with an extra 60 brake horsepower (45 kW; 61 PS) available from a driver operated 'push-to-pass' turbo boost button. Based entirely on road-car production engines and prepared and built by Mountune Racing, it only differs by utilising a Pi Research Pectel electronic fuel injection and a water-cooled Garrett T34 turbocharger with closed-loop boost control. Furthermore, an even higher 'step up' version of this engine is used in the new European-based FIA Formula Two Championship. Developed as a pure race engine and again built by Mountune Racing, this variant includes many all-new lightweight components, and has been converted to a dry sump lubrication system. For its initial 2009 season, it produced a continuous maximum power of 400 brake horsepower (298 kW; 406 PS) at 8,250 revolutions per minute (rpm), and includes a limited duration 'overboost' to 450 brake horsepower (336 kW; 456 PS), aided by an all-new Garrett GT35 turbocharger and a Pi Research Pectel MQ12 ECU. From the 2010 season, base power is increased to 425 brake horsepower (317 kW; 431 PS), and with overboost to 480 brake horsepower (358 kW; 487 PS). VW Polo GTI, VW Golf Mk4 GTI, VW Bora, VW New Beetle, VW Passat B5 and VW Sagitar.VW Sharan . Also on the Audi TT Mk1 (8N), Audi A3 (first gen.), Audi A4, Audi A6, Škoda Octavia, Škoda Superb (first gen.) and SEAT Ibiza. Audi A4, VW Passat, New Beetle, VW Jetta. This version only exists in North American and emerging markets. Volkswagen Golf Mk4 GTI, VW Bora/Jetta, New Beetle, Audi A3, Audi A4 Quattro Sport, Audi TT Mk1 (8N), Škoda Octavia vRS, SEAT León, SEAT Toledo, VW Polo GTI. Audi TT Mk1 (8N), Audi S3 (8L), SEAT León Mk1 (1M) Cupra R (05/03-06/06). This version is built in Győr. "Audi TT quattro Sport revealed". WorldCarFans.com. AUDI AG. 22 February 2005. Archived from the original on 23 October 2010. Retrieved 4 January 2010. The 1.8 Turbo Gasoline (PDF). mi-uk.com. Volkswagen AG. Archived from the original (PDF) on 14 July 2011. Retrieved 12 November 2009. "Formula Palmer Audi Championship – The FPA Car". FormulaPalmerAudi.com. MotorSport Vision. Archived from the original on 11 July 2011. Retrieved 6 January 2010. "The Williams JPH1 FIA Formula Two car". FormulaTwo.com. MotorSport Vision. 6 January 2010. Archived from the original on 19 May 2009. Retrieved 6 January 2010. Volkswagen Industrial – Technical specifications EST gaseous fuel engine (PDF). mi-uk.com. Volkswagen AG. Archived from the original (PDF) on 14 July 2011. Retrieved 12 November 2009. This turbocharged EA113 engine is based on the naturally aspirated 110kW 2.0 FSI. The 2.0L FSI Turbocharged Engine – Design and Function. Self-Study Program (Course Number 821503 ed.). 3800 Hamlin Road, Auburn Hills, MI 48326 USA: Volkswagen of America, Inc. August 2005. "Audi A3 Sportback – in depth". WorldCarFans.com. AUDI AG. 19 July 2004. Archived from the original on 30 July 2013. Retrieved 2 September 2009. This latest EA888 family of internal combustion engines is anticipated to be an eventual complete replacement of the EA113 range. It was wholly designed and developed by AUDI AG. The only common feature with its predecessors is the sharing of the same 88 millimetres (3.46 in) cylinder spacing – which keeps the engine length relatively short, meaning it can be installed either transversely or longitudinally. Grey cast iron (GJL 250) remains the choice material for the cylinder block and crankcase, due to its inherent good acoustic dampening properties. This all-new EA888 range is notable for utilising simplex roller chains to drive the two overhead camshafts, instead of the former engines' toothed-rubber timing belt. Like the final developments of the former EA113 engine generation, all EA888s only use the Audi-created Fuel Stratified Injection (FSI) direct injection. Furthermore, EA888 engines are also able to utilise the Audi-developed 'valvelift' technology, which complements the existing variable valve timing. This new family of engines is scheduled to be universally available for all markets on five continents, within all marques of the Volkswagen Group. The former EA113 range still remains in production. Grainger & Worrall was reported to have cast 50 CGI cylinder blocks for over 12 months as of October 2013, based on the EA888 gasoline engine. of the German technical engine publication mtz, press release 11/2006: "Der neue Audi 1.8 TFSI-Motor"Owners Manual, Passat, U.S. Edition, Model Year 2015. p. 44. "Sporty Dynamism, Superb Comfort: The Audi 1.8 TFSI". AudiWorld.com. AUDI AG – press release. 27 September 2006. Retrieved 4 September 2009. "Audi TT Roadster slims down for Summer". Audi.co.uk. Audi UK. 23 March 2009. Archived from the original on 19 May 2011. Retrieved 4 January 2010. "SEAT Exeo with new engines". Auto-motor-und-sport.de. 3 May 2008. Retrieved 5 May 2010. "Audi Unveils New 1.8 TFSI: 170 HP, 41 MPG". www.motorauthority.com. 4 August 2011. Retrieved 8 August 2011. "Audi ETKA Engine Code" (PDF). vag-codes.info. 3 August 2015. Retrieved 4 February 2016. GJL 250 grey cast iron; 33 kg (73 lb), die-forged steel crankshaft with five 58 mm (2.28 in) diameter main bearings, two chain-driven counter-rotating balance shafts suppressing second degree free inertial forces and oil pump, horizontal-baffled oil sump. The water pump bolts to the side of the block, under the intake manifold, and is driven by a toothed belt and a pulley on the back of the intake-side balance shaft. "Audi adds 2.0 TFSI with Valvelift to A5 Coupé". PaulTan.org. 25 June 2008. Retrieved 4 September 2009. Winner of the "1.8-litre 2.0-litre" category in the 2009 annual competition for International Engine of the Year. An all-new engine designed by AUDI AGs high-performance subsidiary quattro GmbH (formerly Audi Sport GmbH), harking back to the original turbocharged five cylinder Audi engines in the "Ur-" Audi Quattro of the 1980s. A world first for a petrol engine, its cylinder block is constructed from compacted vermicular graphite cast iron (GJV/CGI) – first used in Audi's large displacement, high-performance Turbocharged Direct Injection (TDI) diesel engines. "Potent new Audi TT RS takes five in Geneva". Audi.co.uk. Audi UK. 3 March 2009. Archived from the original on 19 May 2011. Retrieved 4 January 2010. "Audi TT RS World Debut in Geneva". WorldCarFans.com. AUDI AG. 3 March 2009. Retrieved 2 September 2009. "Audi TT RS in Depth – priced at 55,800 euros". WorldCarFans.com. AUDI AG. 29 May 2009. Retrieved 2 September 2009.
was winner of the "2.0-litre 2.5-litre" category in the 2010, 2011, 2012, 2013 and 2014 annual competition for International Engine of the Year. This 2.5 VR6 engine is only available for Chinese market on Volkswagen Teramont. It is derived from now retired 3.0 VR6 engine, which also was available in China only[citation needed]. 2,492 cubic centimetres (152.1 cu in) 10.6° VR6; bore, stroke and compression ratio are not disclosed at the moment. DDKA: Volkswagen Teramont, chinese market only. The 2.8 V6 is a stroke-reduced version of the 3.2 V6 FSI introducing the Audi valvelift variable control of inlet valve lift. "KS Aluminium-Technologie: engine blocks for the new Audi A6". Rheinmetall.de. Rheinmetall AG. August 2004. Archived from the original on 4 October 2012. Retrieved 13 January 2010. "The new 2.8 FSI with Audi Valvelift system" (Press release). Audi AG. 27 September 2006. This engine unveiled in 2000 is an all-aluminium alloy, longer stroke version of the 2.8 V6. "The New Audi A4" (Press release). Audi AG. 10 October 2000. Parks, Jim (4 March 2009). "First Hybrid Application Of TVS Supercharger To Appear On 2010 Volkswagen Touareg; Fuel Economy Improved 17- 25 Percent". Eaton.com. Eaton Corporation – press release. Retrieved 24 July 2009. The base engine is the 260 kilowatts (354 PS; 349 bhp) 3.0 TFSI, available on some Audi S models and a slightly detuned version(250 kilowatts (340 PS; 335 bhp)) with 48V mild hybrid system on some higher end Audi A models. The 2.9 TFSI engine is a shorter stroke variant with much higher output. "VW Golf R32 (Mk4) – in depth". WorldCarFans.com. Volkswagen AG. 7 August 2002. Archived from the original on 5 August 2009. Retrieved 2 August 2009. "The New Volkswagen Golf R32 (Mk4)". BillsWebSpace.com. Volkswagen Group Australia. February 2003. Retrieved 5 September 2011. "New Volkswagen Golf R32 (Mk5)". WorldCarFans.com. Volkswagen AG. 23 September 2005. Archived from the original on 11 July 2009. Retrieved 2 August 2009. "New Audi A6 in depth". WorldCarFans.com. Audi AG. 8 April 2004. Archived from the original on 29 July 2013. Retrieved 31 July 2009. "Volkswagen Passat 3.6". Car and Driver. December 2005. Archived from the original on 29 September 2007. "Volkswagen Passat R36 technical specifications". Car Enthusiast. Of their eight-cylinder petrol engines, all Volkswagen Group V8 engines are primarily constructed from a lightweight cast aluminium alloy cylinder block (crankcase) and cylinder heads. They all use multi-valve technology, with the valves being operated by two overhead camshafts per cylinder bank (sometimes referred to as 'quad cam'). All functions of engine control are carried out by varying types of Robert Bosch GmbH Motronic electronic engine control units. These V8 petrol engines initially were only used in cars bearing the Audi marque, but are now also installed in Volkswagen Passenger Cars 'premium models'. They are all longitudinally orientated, and with the exception of the Audi R8, are front-mounted. Based on the existing Audi 40 valve V8, this new engine is heavily revised over its predecessor, with all-new components including: crankshaft, connecting rods and pistons, cylinder heads and valvetrain, oil and cooling system, intake and exhaust system, and engine management system. It is available in two versions; a basic or 'comfort' version, first used in the Audi Q7; and a sports-focussed high-revving version, with features borrowed from motorsport, for the B7 RS4 quattro and the Audi R8. This is the first eight-cylinder road car engine to use Fuel Stratified Injection (FSI), which was successfully developed by Audi in their Le Mans winning R8 racing car. The 5.2 V10 FSI was developed directly from this V8 engine. "KS Aluminium-Technologie: engine blocks for the new Audi A6". Rheinmetall.de. Rheinmetall AG. August 2004. Archived from the original on 4 October 2012. Retrieved 27 January 2010. Audi 4.2-liter V8 FSI Engine – Self-Study Programme 921603. 3800 Hamlin Road, Auburn Hills, Michigan 48326, USA: Audi of America, Inc., Service Training. July 2006. "Audi RS4 Saloon – Technical Data" (MS Word document). AUDI AG. February 2005. Retrieved 14 September 2009. "Geneva Motor Show: Audi RS4 – The Sports Car for 365 Days a Year". VWvortex.com – Audi News. AUDI AG. 1 March 2005. Archived from the original on 16 July 2011. Retrieved 14 September 2009. "New Audi RS4". WorldCarFans.com. AUDI AG – press release. 5 September 2005. Archived from the original on 29 February 2012. Retrieved 16 September 2009. "Audi Q7 in depth". WorldCarFans.com. AUDI AG – press release. 31 January 2006. Archived from the original on 3 October 2009. Retrieved 16 September 2009. "New Audi A6 in depth". WorldCarFans.com. Audi AG. 8 April 2004. Archived from the original on 22 April 2012. Retrieved 9 September 2009. Audi version of the engine includes electronic monitoring of the oil level, while Bentley engine includes a dipstick for oil check. In addition, the Bentley engine uses switchable hydraulic mounts instead of Audi's active electrohydraulic engine mounts. The Bentley engine does not include a stop-start system. This 6.75 litre V8 is a legacy engine, developed by Rolls-Royce Limited before the takeover of Bentley Motors Limited by the German Volkswagen Group, but still used during their ownership. "2008 Bentley Brooklands Coupe". LeftLaneNews.com. LeftLane. Retrieved 2 January 2010. This 'Audi V10 TFSI' – a 5.0 litre V10 'biturbo' petrol engine is one of the most powerful engines fitted into any Volkswagen Group automobile. From its DIN-rated maximum power output of 426 kilowatts (579 PS; 571 bhp), this engine generates a specific power output of 85.4 kilowatts (116.1 PS; 114.5 bhp) per litre displacement. "Audi RS6 Sedan unleashed ahead of Paris debut". WorldCarFans.com. AUDI AG. 12 August 2008. Retrieved 16 February 2010. A first in Audi's history, this new generation high-performance V10 engine is based on Audi's V8 FSI engines, and retains the same fundamental design principals of the V8 FSI, including the crankcase, cylinder heads, valvetrain, fuel system and intake manifold. However, an all new crankshaft, balance shaft, double-chambered intake manifold with dual throttle valves, exhaust manifold, and ECU—are all unique to the V10. As part of the new V10 engine development, specific emphasis was placed on 'refinement', 'comfort' and 'sportiness' – as required for installation in Audi high-performance luxury cars. As well as gaining two additional cylinders compared to the V8, it has been bored by an extra two millimetres, and also shares the 90 degree (°) cylinder bank angle of the recent Audi V engines. Audi continue to use the Fuel Stratified Injection (FSI) technology, originally developed in the Audi R8 LMP endurance race cars. This engine is often, but incorrectly, referred to as a derivative of the Gallardo's original 5.0-litre Lamborghini V10, which was also developed under the Volkswagen Group ownership. However, the subsequent 5.2 V10 FSI installed in the Gallardo LP560 and Audi R8 V10 is fundamentally identical to this Audi unit, save for a stronger crankshaft with solid main pin design, forged pistons, dry sump oiling system, different intake and exhaust valves, and engine management systems. Audi 5.2 litre V10 FSI engine. Service Training – Self-Study Programme (SSP 376 ed.). D-74172 Neckarsulm, Germany: AUDI AG. June 2006. The (Audi) V10 belongs to the next generation of Audi V-engines, all of which have a 90-degree included angle and a spacing of 90 millimetres between cylinder centres. Compared to the engine in the Lamborghini Gallardo, which has a spacing of 88 millimetres between cylinder centres, the Audi engine has several new features in key areas. "New Audi S8". WorldCarFans.com. AUDI AG. 19 October 2005. Archived from the original on 29 February 2012. Retrieved 25 August 2009. "New Audi S8 in depth". WorldCarFans.com. AUDI AG. 2 December 2005. Archived from the original on 30 July 2013. Retrieved 25 August 2009. "New Audi S6 in depth". WorldCarFans.com. AUDI AG. 20 March 2006. Archived from the original on 29 February 2012. Retrieved 25 August 2009. This is the second Lamborghini engine developed by AUDI AG, who became owners of Automobili Lamborghini S.p.A. following the takeover of Lamborghini by the German Volkswagen Group. It is a development of Audi's fundamentally identical 5.2 V10 FSI 320-386kW engine as used in the Audi C6 S6 and Audi D3 S8. This variant has been de-tuned for the Audi R8 V10. "Lamborghini Gallardo LP560-4 – New Gallardo V10 bends design rules – Secrets behind Lamborghini's latest projectile, the LP560-4". evo.co.uk. Dennis Publishing. 7 March 2008. Retrieved 30 August 2009. "2012 Lamborghini Gallardo LP 570-4 Spyder Performante". topspeed.com. 7 November 2011. Retrieved 14 November 2014. "2010 Lamborghini Gallardo LP570-4 Superleggera". supercars.net. Retrieved 14 November 2014. "Automobil Revue": catalogue edition 2008, p.316 and 2006, p.285. "The Lamborghini Huracan LP610-4 Is The Most Advanced Lambo Ever". jalopnik.com. Jalopnik. 20 December 2013. Retrieved 13 January 2015. This W12 badged W12 engine is twelve cylinder W engine of four rows of three cylinders, formed by joining two imaginary 15° VR6 engine cylinder blocks, placed on a single crankshaft, with each cylinder 'double-bank' now at a 72° angle. This specific configuration is more appropriately described as a WR12 engine. This Volkswagen Group engine is also used with slight modification, and with the addition of two turbochargers in the Bentley Continental GT and Bentley Continental Flying Spur. It has also been used in a 600 horsepower (450 kW; 610 PS) form aboard the Volkswagen W12 prototype sports car to establish a 24-hour record of 323 kilometres per hour (200.7 mph) in 2002 at the Nardò Ring in Italy. "Volkswagen Phaeton – in depth". WorldCarFans.com. Volkswagen AG. 1 March 2002. Archived from the original on 23 April 2013. Retrieved 26 August 2009. "Audi A8L details". WorldCarFans.com. Audi of America. 12 January 2004. Archived from the original on 30 July 2013. Retrieved 26 August 2009. "Continental Flying Spur specification". BentleyMotors.com. Bentley Motors Limited. Retrieved 2 September 2009. "Continental Flying Spur Speed specification". BentleyMotors.com. Bentley Motors Limited. Retrieved 2 September 2009. This is a new V12 engine developed for Lamborghini. The company's fourth in-house engine and their first new V12 since its founding, it made its first appearance in the Lamborghini Aventador. "Lamborghini Aventador Technical Specifications". Lamborghini. Retrieved 6 November 2014. "Lamborghini Aventador 50th Anniversario Technical Specifications". Lamborghini. Retrieved 13 January 2015. "Lamborghini Veneno Roadster Technical Specifications". Lamborghini. Retrieved 13 January 2015. This W16 badged engine is the first and so far the only production W16 engine in the world. It is a sixteen-cylinder W engine, of four rows of four cylinders, and is created by joining two VR8-engined 15° cylinder banks at the crankcase, and placed on a single crankshaft, with each cylinder 'double-bank' now at a 90° V-angle. This specific configuration method means it is more appropriately described as a WR16 engine. "Photograph of the Bugatti W16 cylinder block" (jpg image). Retrieved 30 December 2009. "2006 Bugatti Veyron W16 Engine". SuperCarNews.net. Bugatti Automobiles S.A.S. Archived from the original on 15 June 2008. Retrieved 30 December 2009. "Bugatti Veyron 16.4 powerplant". WorldCarFans.com. Bugatti Automobiles S.A.S. 2 February 2006. Archived from the original on 30 July 2013. Retrieved 25 August 2009. "Bugatti Veyron 16.4 Super Sport revealed". WorldCarFans.com. Bugatti Automobiles S.A.S. Retrieved 19 December 2010. ^ Hauri, Stephan (21 May 2014). "Drei für einen Liter" [Three for a liter] (PDF). Automobil Revue (in German). Bern, Switzerland: MoMedia AG (21). "Volkswagen engines ID code". AutoShoppingCenter.com. n.d. Archived from the original on 6 December 2009. Retrieved 30 July 2009. "Audi engine ID code". AutoShoppingCenter.com. n.d. Archived from the original on 30 August 2009. Retrieved 30 July 2009. Wikimedia Commons has media related to Volkswagen Group engines.